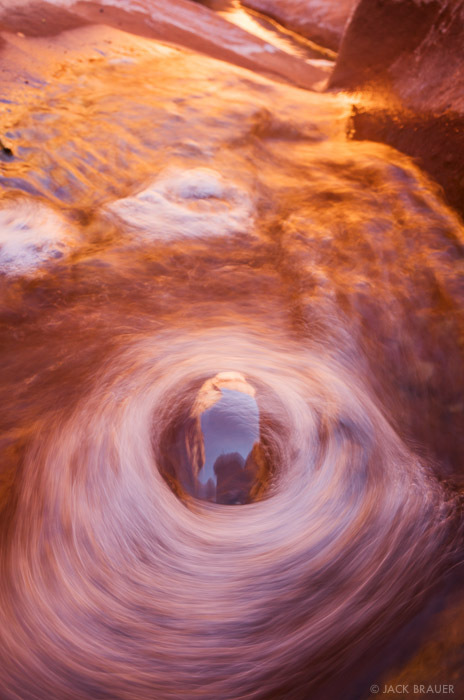 Light at the end of the tunnel in Willis Creek, Grand Staircase-Escalante National Monument, Utah. 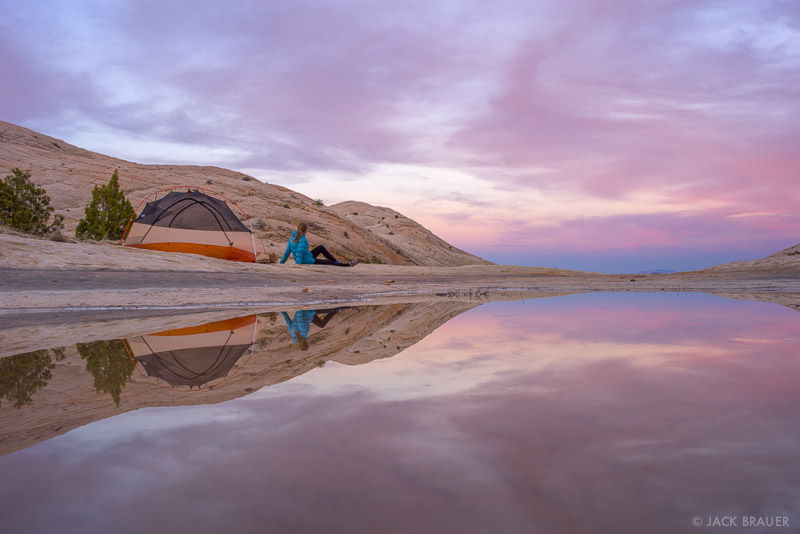 Posted in Backpacking & Trekking, Deserts & Canyons and tagged Escalante, Utah on April 29, 2018 by Jack Brauer. 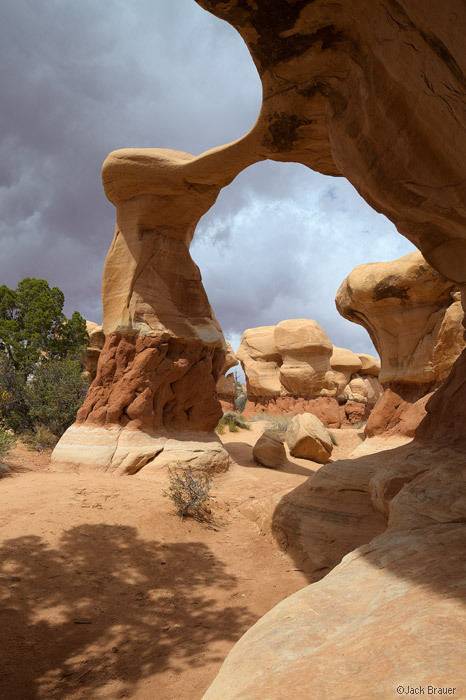 Metate Arch in the Devil’s Garden – April. On our way back to Colorado from California, we spent about 10 days in the canyons of Utah car camping and doing some fantastic day hikes. 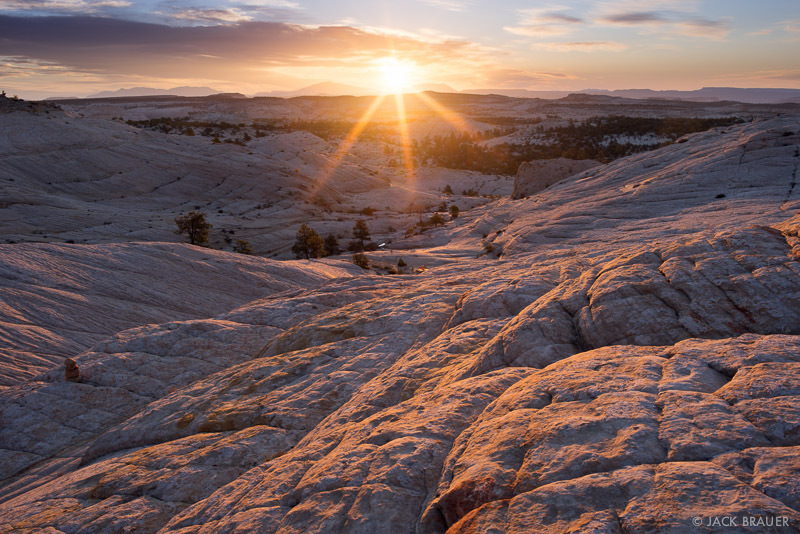 We started in Escalante National Monument, probably my favorite canyon region in all of Utah. 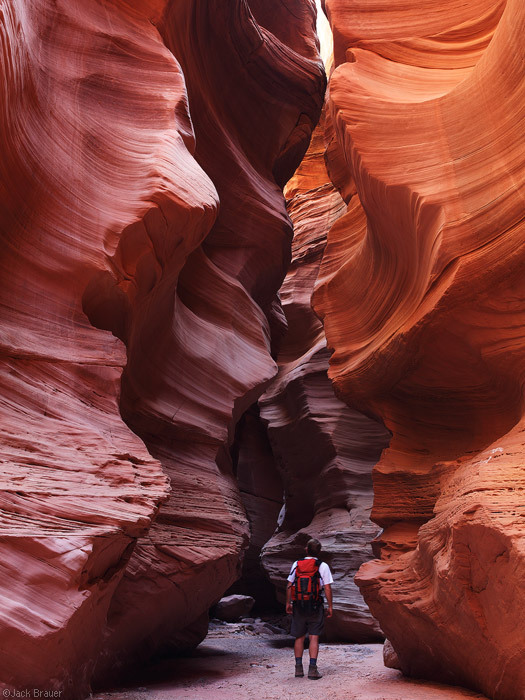 Hiking in a narrow slot canyon. 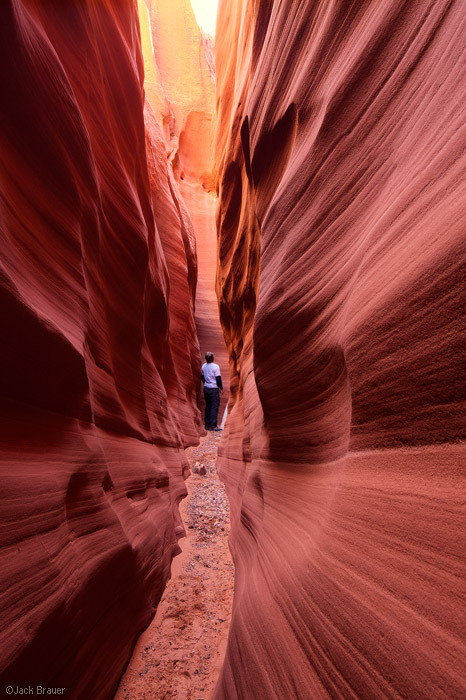 Our first hike was through a seldom visited slot canyon called Red Breaks. Although the guides I read called this a “non technical” canyon, it ended up being a very challenging slot canyon, with numerous puzzling chokestones that had to be climbed over. Some of these chokestones required sketchy exposed moves or chimney maneuvers to pass, and we became a bit worried after we had climbed over enough of these that turning back would not have been a safe option, yet each successive chokestone became more and more difficult. 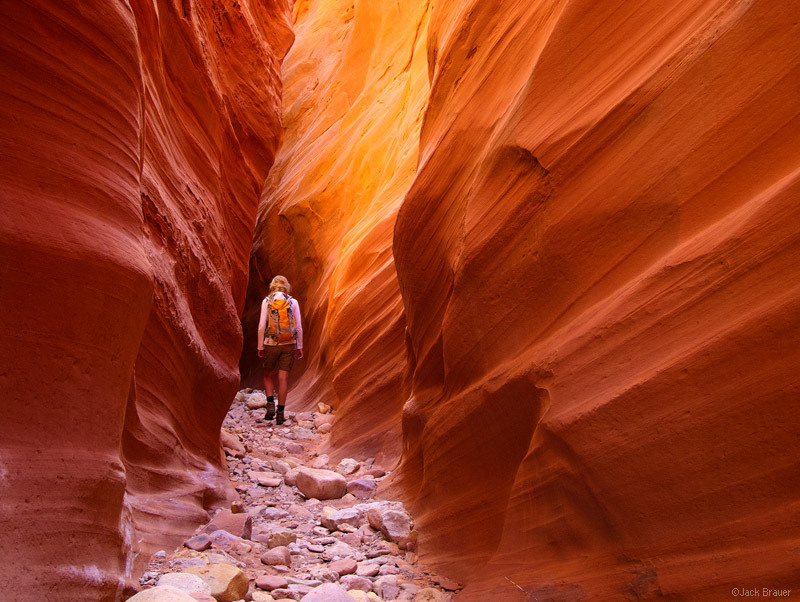 Hiking in a deep and narrow slot canyon. Not only were the chokestones challenging in Red Breaks, but in some areas the slot was so narrow that we could barely squeeze through while pulling our backpacks behind us. 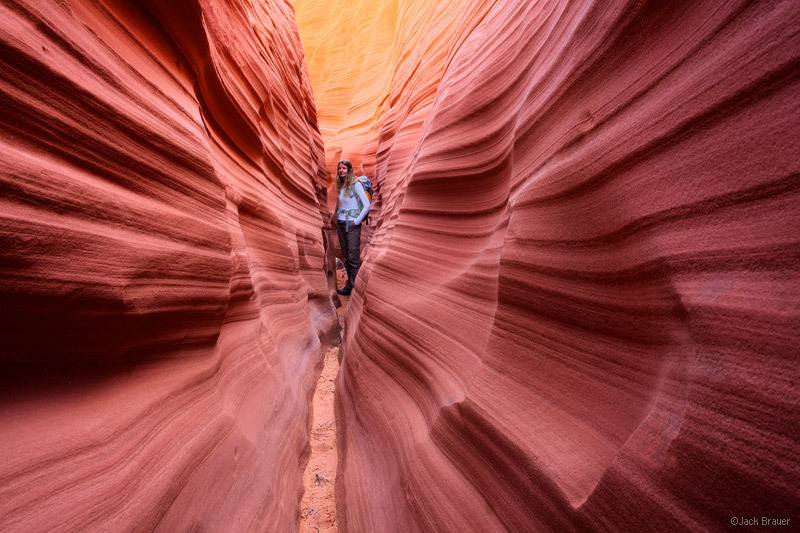 A wider person or anyone with claustrophobia should not attempt this slot canyon! I would classify this slot as “non technical” only for very proficient canyoneers and comfortable climbers; for anyone else I would stress that this is an extremely challenging slot canyon. In fact it was the first slot that I was happy to finally exit! 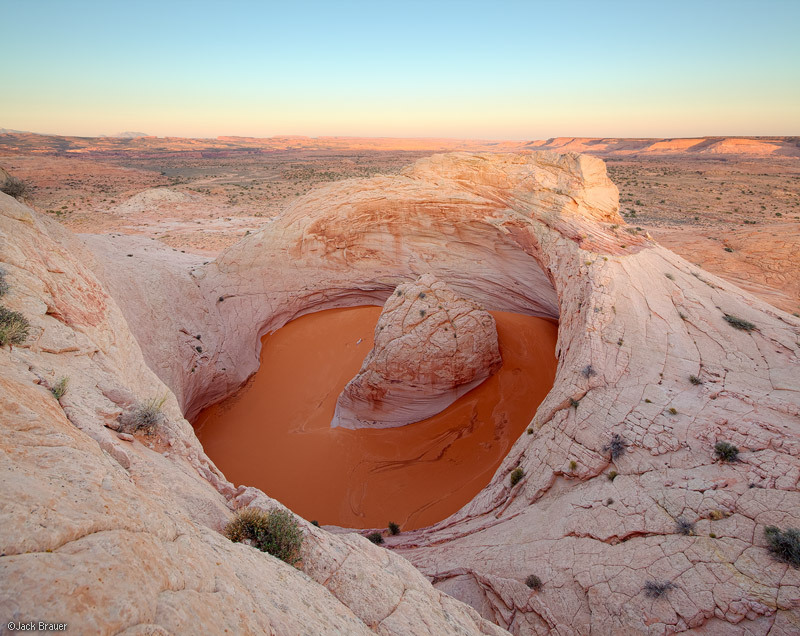 A bizarre and fascinating sandstone formation, filled with orange sand. From Red Breaks we hiked cross country over slickrock slabs and valleys to a fascinating sandstone formation called “The Cosmic Ashtray”. This is one of the more curious and mystifying geologic formations I’ve seen, and I have no idea how such a thing could have formed. It’s difficult to comprehend the scale in the photo above, but suffice it say, it’s enormous! We stayed until sunset and hiked back to the truck in the dark… all in all, a 12 hour day of hiking! Not too shabby for the first of eight days in a row of hiking! Our second hike was to the famous Zebra slot. The slot itself is actually very short and not very deep, but it has these beautiful striations and embedded moki ball stones which make it very photogenic. Photogenic, that is, if you don’t care about taking the same photograph that every other photographer takes, more or less. Claudia was kind enough to pose in there for me, which adds some scale and reality to the otherwise surreal formations. 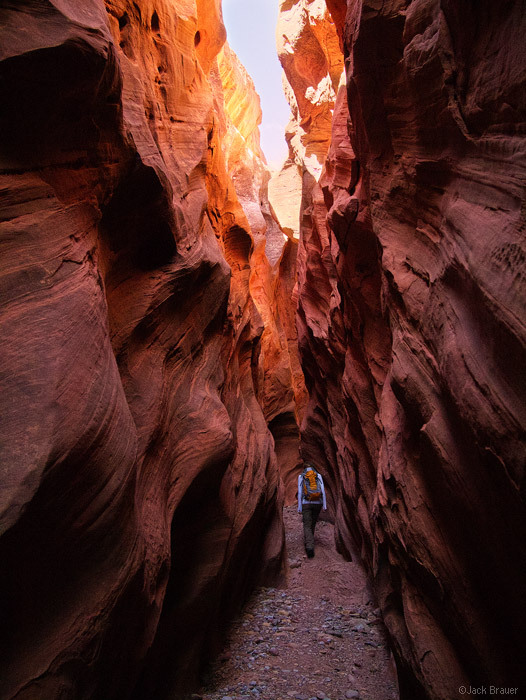 Hiking through deep narrows in Little Death Hollow Canyon. After Zebra, we drove around to the other side of the Escalante River drainage via the incredible Burr Trail Road which leads east from the town of Boulder through jaw-dropping canyon scenery. I’m not sure if I’ve ever driven a more scenic drive in the desert! Our destination was Little Death Hollow canyon, another slot canyon off the Escalante. 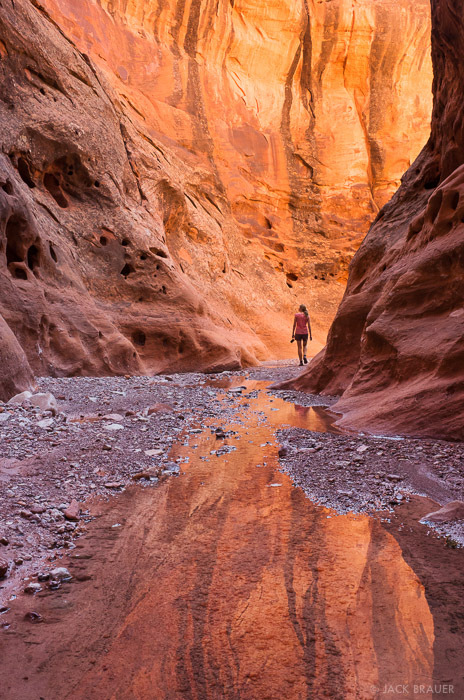 Hiking through the narrows of Little Death Hollow Canyon. 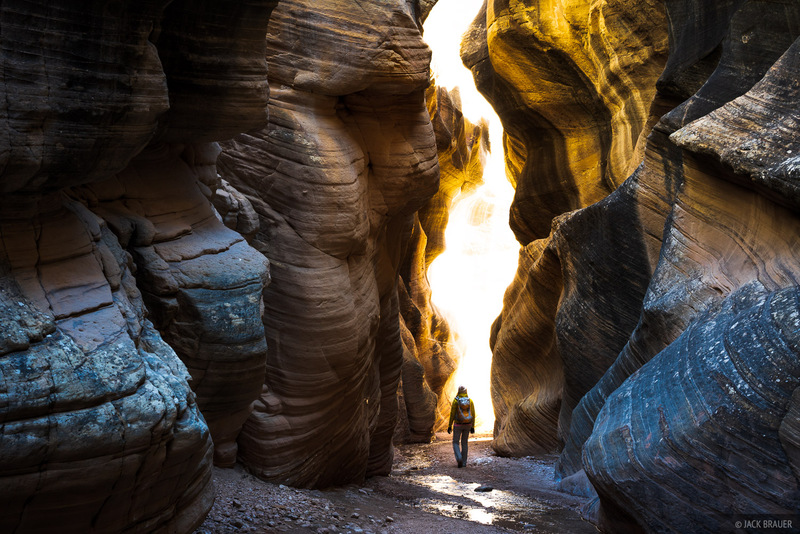 Little Death Hollow is not an especially deep slot canyon, but it goes on for quite a long way and makes for a great hike – especially around midday when the sunlight is bouncing around between the canyon walls. 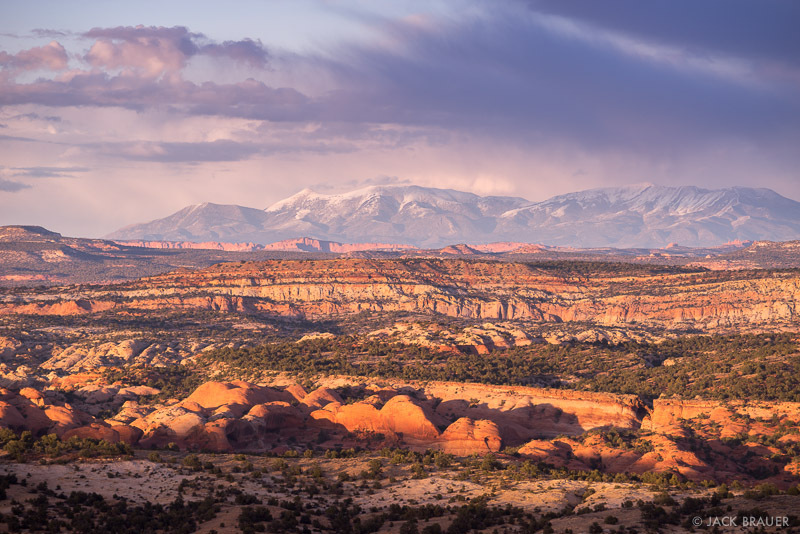 Posted in Deserts & Canyons and tagged Capitol Reef, Escalante, Robbers Roost, Utah on April 28, 2013 November 21, 2013 by Jack Brauer. 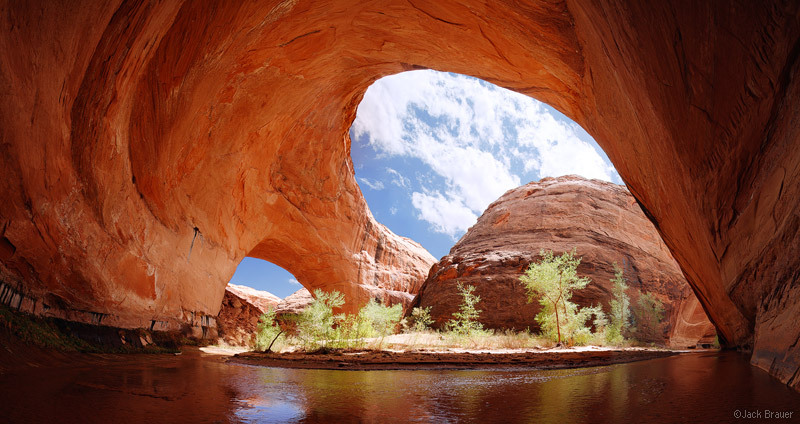 A wideangle panoramic view of the impressive Jacob Hamblin arch in Coyote Gulch. After our trip in Robbers Roost Canyon, we headed to Escalante for another backpacking trip into one of my favorite canyons of all – Coyote Gulch in Grand Staircase Escalante National Monument. It’s been about 12 years or so since I’ve been here, but I still remembered how awesome it was. 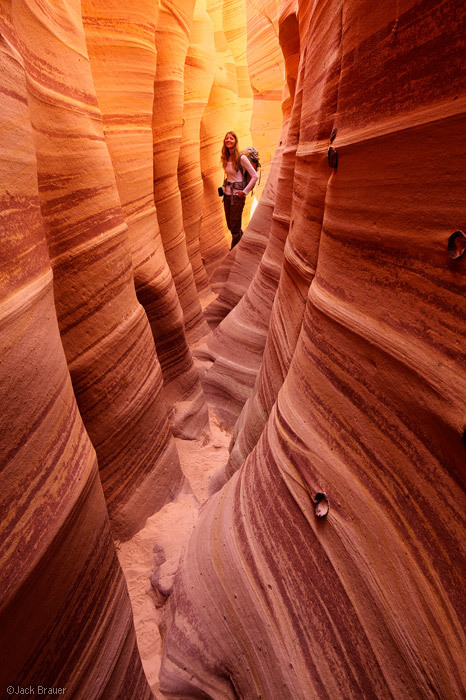 Posted in Backpacking & Trekking, Deserts & Canyons and tagged Escalante, Utah on April 8, 2012 November 21, 2013 by Jack Brauer. I just posted a bunch of photos from my trip in Utah! Though I was only out there for two weeks total, it truly felt like a full month. It always amazes me how time slows down when I travel. I think that is the secret of living longer… to travel a lot! In that regard, I suppose it’s not all about how long you live, but how well you spend your time while you’re here. (I say that after having the last three days fly by while working on the computer again). Anyhow, now I’m back home in Ouray, Colorado. It feels great to finally be back home. I’m really looking forward to summer. >> Check out my new Utah photos here. 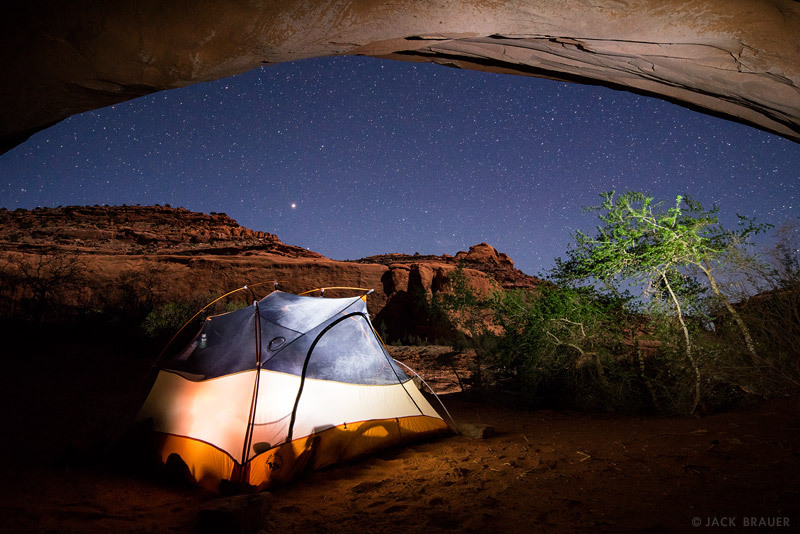 Posted in Backpacking & Trekking, Deserts & Canyons and tagged Capitol Reef, Escalante, Robbers Roost, Utah, Zion on May 6, 2010 May 19, 2013 by Jack Brauer.